While Lulu Lytle originally dreamed of becoming an Egyptologist, her current role as cofounder and creative director of Soane Britain indulges her passions for travel, antiquities, textiles and the exotic, all brought to fruition through the best of handmade British craftsmanship. As a longtime admirer of Lulu’s elegant designs and worldly point of view, it was a thrill to finally see her brilliant aesthetic in both Soane‘s London showroom and Lulu’s Bayswater flat when Susanna Salk and I were there last fall shooting the British sequel to At Home with Dogs and Their Designers. So please tag along for a special behind the scenes visit with Lulu in her colorful, pattern-filled, inspiring home. 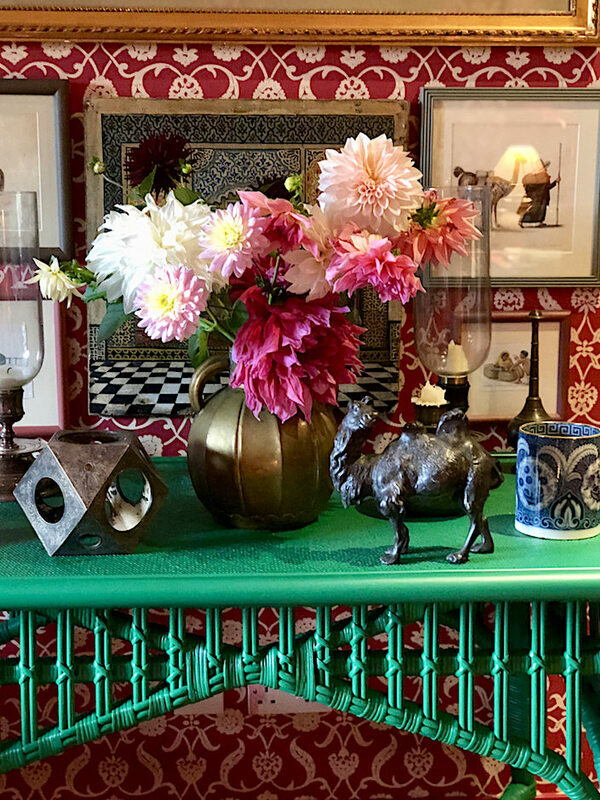 As a piece in last week’s T Magazine espoused, English design is celebrating its “long-held preference for color, wit and wackiness.” And if ever there were a home that represented this aesthetic, it is Lulu’s, where pattern, color and wanderlust meet with fearless aplomb. In more cautious and less knowledgeable hands, this eclecticism might result in a cacophonous disaster. But years of travel, passion and curiosity have fueled this successful mix that no doubt brightens every gray London day! 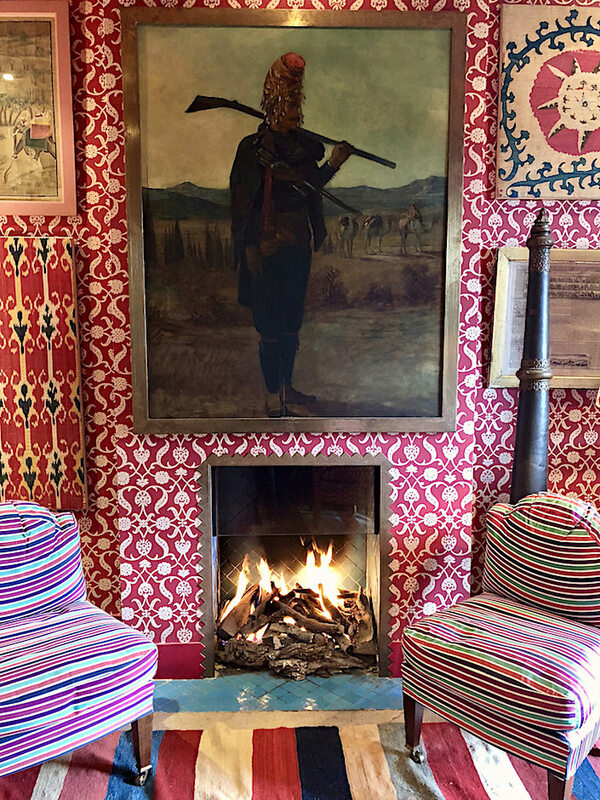 Take for example her London den where Soane’s Lotus Palmette, based on a 15th c. Safavid silk velvet document, envelops the room against an antique dhurrie from dealer Peter Hinwood and Soane baby chairs upholstered in their exuberant Damascus Stripe! On The Rattan Leighton Table, Soane’s upscaled version of an original design from the Dryad Cane archive, sit the weekly flower delivery from The Land Gardeners, whose home Susanna and I had recently shot, a pair of Soane’s Verandah Lights and several of Lulu’s finds from sources high and low, including a bronze camel, part of her extensive and all encompassing collection of animals in art. But textiles have been Lulu’s love for decades. 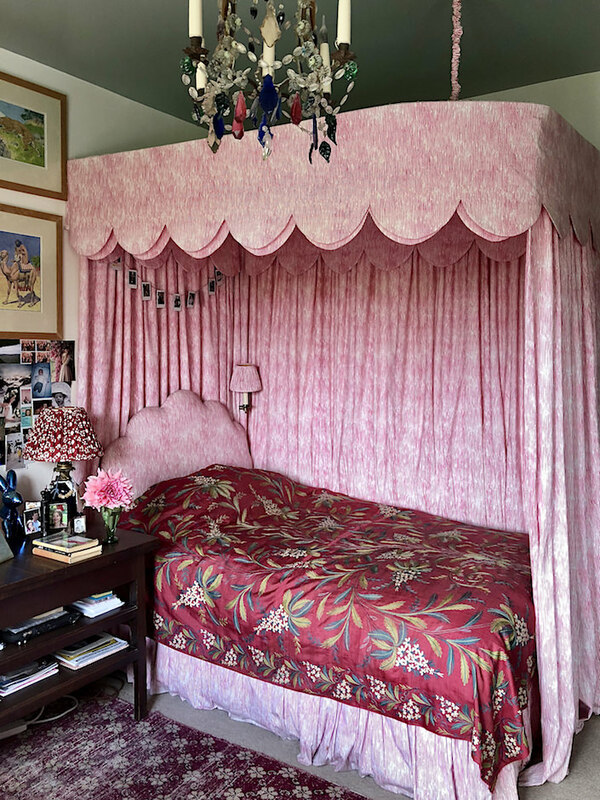 In her daughter’s room, an antique bedcover mixes effortlessly with Soane’s Ripple stripe. 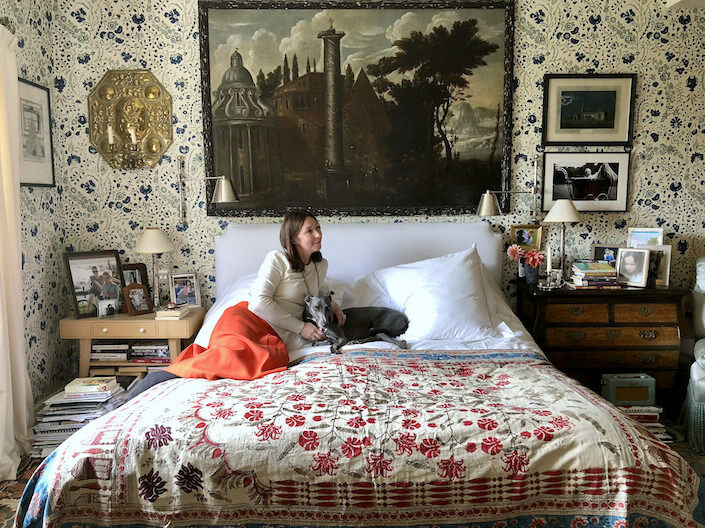 We could all take a page from Lulu design ethos, above in her bedroom with her beloved whippet Panther, where she walks the walk of Soane’s mission, delivering a modern eclecticism that is personal, inclusive and optimistic. So thank you Lulu – we are thrilled to be able to share your beautiful home! This entry posted in art, At Home with, furniture, interior design, Quintessence video series, travel, video. Entry Tags: At Home with, interior design, London, Lulu Lytle, made in Britain, Soane, Video Bookmark the permalink. What a fabulous video, (loved pausing it to look at it all in detail) , love the moody landscape over her bed, of course love Panther….and feel completely in sync with the piles of books next to her bed. Especially loved seeing the Photo of the Landgardeners in their garden with the puppy sitting with the garden glove in his mouth! Love your work SO much, ladies, wish I could fit in your suitcase! I so enjoyed this video. Lulu’s home is warm, colorful and so inviting. I admire her fearlessness and enthusiasm in her surroundings. As someone who loves patterns I found it intoxicating! Keep up your very creative endeavors Susanna and Stacey. Love this post! The textiles and patterns are most inspiring. I’ve been thinking of painting my pinky-red room but I think I’ll keep it now! Exactly what I needed on Monday morning. So charming, warm and inviting. Loved the interaction between the two of you while admiring Stacey’s ability to capture it all. I so look forward to whatever is next. You two are the best! Amazing use of colours, very other worldly. love it!! The pattern and color masterfully mixed in every frame, I too paused often and long to see everything in detail. Thank you Stacey, Susanna, and of course Lulu. Loved it! Every bit as colourful, cultured and individual as I expected. Thank you Stacey and Susanna for beinging us this tour! 86 queries in 1.303 seconds.